The only two with any significant traffic were the existing ports of Kilrush [which was the only one to have a crane] and Clare. The other four were a waste of money [but are nowadays delightful places to visit]. 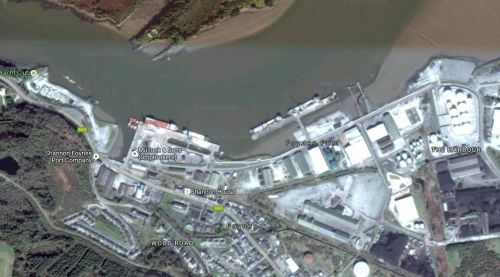 Foynes Harbour, when complete, will consequently give secure quayage to sea-going vessels at all times of tides, and in fact will be the only port on the Shannon possessing that advantage; all the others, including the quays of Limerick, being dry, or nearly so, at low-water. And so indeed it proved to be. Foynes, sheltered by its island to the north, grew as a result of the development of the quays. But Foynes never became quite as important as some folk hoped, in the 1850s, that it would become. My Lords [of the Treasury] have before them a letter from the Secretary to the Admiralty, dated the 23rd instant, enclosing copies of a letter from the Board of Trade, dated the 8th instant, and an extract from a petition signed by a large number of landed proprietors in Ireland, praying for an inquiry with a view to the adoption as a Packet Station of one of the harbours in Ireland, and suggesting the appointment of a Commission for the above purpose. Captain Stephen Ellerby, one of the Elder Brethren of the Trinity House. 1st. 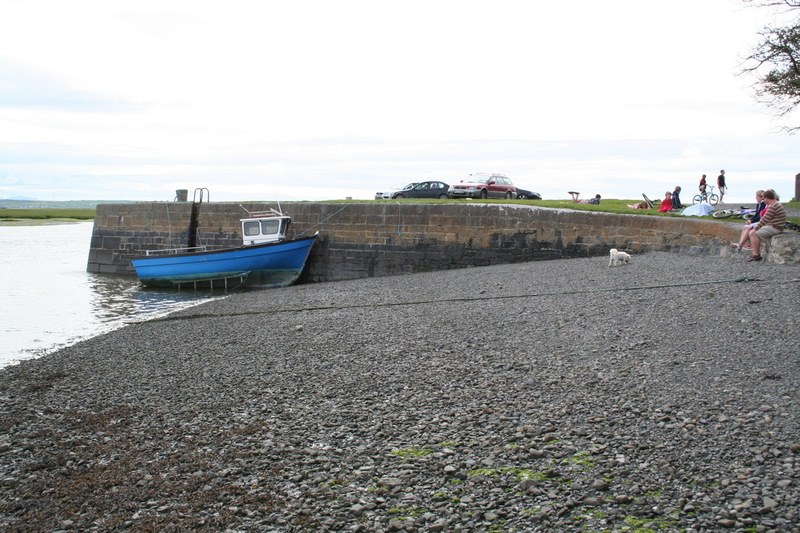 As to the harbours in Ireland best suited for a Packet Station. 2nd. The advantages and disadvantages of adopting a harbour in Ireland for a Packet Station, so far as regards the trade and other interests of the empire, and to report the evidence to the Admiralty, with such observations as may enable Her Majesty’s Government to form a judgment on the premises. My Lords request that the Lords Commissioners of the Admiralty will give such further directions as may be required for the meeting of the Commissioners, and for the conduct of their proceedings. a third line serving Havre and New York, also calling at Southampton. thence by steamer across the Atlantic. The Commissioners allowed for time on transits between steamers and railways; they assumed that the railways could operate at 30 miles per hour, which was 5 mph faster than the average at the time. They considered nine possible Irish ports: Cork, Long Island Sound, Berehaven, Crookhaven, Dunmanus Bay, Valentia, Galway and, in the Shannon Estuary, Foynes and Tarbert. Most of those had no rail connection to Dublin, but the Commissioners gave them the benefit of the doubt, assuming that a line would be built to wherever the packet station might be located. The Commissioners took their job seriously. They circulated queries and received responses from 83 individuals and institutions including shipping firms, naval and coastguard officers, government departments, chambers of commerce, local politicians and officials. They interviewed 32 individuals and deputations, some of them more than once. They considered 36 items of “further documentary evidence” and 53 “further papers, reports &c” and wrote up the whole lot, including two plans (maps). 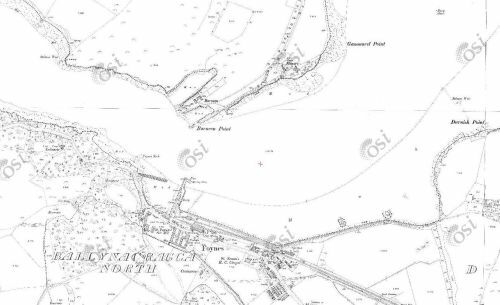 It appears, from the evidence of the majority of the naval officers to whom we have referred, that the navigation of the west coast of Ireland is dangerous, particularly in the winter. The coast from Mizen Head round to Galway Bay is, in nautical language, “steep-to”; there being 100 fathoms water at 18 to 29 miles off its outlying dangers. It is also subject to fogs and hazy weather, and to frequent heavy gales of wind blowing towards a lee-shore, with high Atlantic seas and very uncertain soundings. We find no reason to conclude that the local and particular advantages resulting from the proposed measure would be so great, or the saving of time so important, as to counterbalance the large additional expense which would be entailed upon the Imperial Revenue, and the evils and inconvenience which would be inflicted on the great body of the mercantile and travelling portion of the community by removing the packets from the place where they were originally established, as being the focus of the commercial transactions of the United Kingdom with the North American continent. from tender to transatlantic steamer. Apart from the inconvenience, the process would have introduced several opportunities for delays. The Commissioners, then, rejected both Foynes and Galway. But several people in Ireland rejected the Commissioners’ findings, mostly on grounds that were entirely irrelevant. There was a particularly colourful diatribe in the Galway Mercury, and Weekly Connaught Advertiser of 8 May 1852, which lauded Galway’s “glorious expanse of water, deep, and capacious and sheltered as it is, and pronounced by the most competent naval authorities to be one of the finest ports in the whole world”. The decision not to base the packet station there was “a fair specimen of Saxon justice to Ireland”: basing the packet station in Galway would “have the effect, in the course of a few years, of destroying in a great measure the commercial pre-eminence of that country [England, rather than Great Britain or the United Kingdom, it seems], and transferring much of its wealth and its greatness to this island which it hates so cordially, and which for six centuries it has ceased not to plunder and oppress”. The editor did not, alas, have space to consider such mundane matters as the inconvenience to British passengers of being forced to travel to America via Galway. But the focus of the promoters of an Irish packet station, and especially of the vociferous Galway gang, turned to communication between Ireland and the USA. There were unsuccessful attempts to set up steamship companies; Packet Station Committees were set up [eg Tipperary Free Press 28 January 1852 on Mr Wagstaff and on the Dublin Packet Station Committee; Galway Mercury, and Connaught Weekly Advertiser 31 January 1852 on the Irish and American Steamship Company]; the merchants of Belfast were persuaded that, with a packet station in Galway, American merchants and buyers would visit Ireland and (once a railway link was provided) especially Belfast before visiting England and Scotland [Northern Whig 12 February 1852; Morning Post 16 February 1852; Belfast News-Letter 23 February 1852]. Also in February, the Limerick Packet Station Committee was forced to publish a pained refutation of the recommendations of one James Whiteside, a member of the Dublin committee who was a strong advocate of the Galway proposal [Report of the Dublin Committee Considered, and Mr Whiteside’s Statement Reviewed, with remarks on the relative advantages of the Shannon and Galway Bay published by direction of the Limerick Packet Station Cmmittee, Browne & Nolan, Dublin 1852]. Unfortunately, in the same month, Lord John Russell’s Whig government collapsed and the Earl of Derby set up a minority Conservative government — in which the same James Whiteside, MP for Enniskillen, became Solicitor-General for Ireland. The Tribes of Galway soon descended on the unfortunate Prime Minister, with a “numerous and influential deputation” led by that turbulent priest, the Very Rev Peter Daly, a spiritual father of Monsignor James Horan, determined to wring every penny he could from the temporal power. The Rt Hon Earl said that improving Galway’s harbour would make sense, in an imperial context, only as a packet station. And because the Irish Packet Station Commissioners had recommended two Irish ports, Foynes and Galway, the first step was to decide between the two of them. Accordingly, the government had decided to appoint three naval officers to visit the two ports, inquire into their relative advantages and report back. He could not commit himself to anything more until he had the report and he was sure that the deputation understood that [Dublin Evening Mail 10 May 1852]. That got Derby through the general election in June, after which he formed another minority government, which lasted only until December. In the meantime, though, the three naval officers — Captains F W Beechey, Henry Smith and James Crawford Caffin — visited Galway and inteviewed witnesses recommended by the Harbour Commissioners and other authorities; they also inspected the port and considered what works might be necessary. 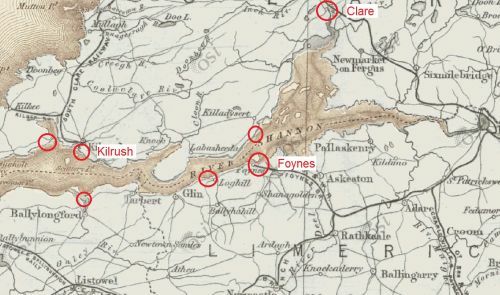 They then embarked on HM steam sloop Geyser and sailed to Limerick: they were thus able to see the approaches to both ports. They visited both Foynes and Tarbert on a small steamer and, again, interviewed witnesses. They returned to Dublin by railway. Their focus was on whether Galway and the Shannon would be accessible at all states of the tide, at all times day or night, and in all weathers. Only with such access could the “greatest regularity and dispatch” be maintained for “steamers of the largest class”. That access was needed whether the ports were to be packet stations or harbours of refuge or both. It was appreciated that both ports would probably need engineering works to be carried out, as well as links to the railways. accordingly, neither Galway nor the Shannon was suitable as a packet station. The report is Galway and Shannon Ports: Return to an Order of the Honourable The House of Commons dated 31 March 1859 for a copy of the instructions of the 11th day of June 1852 from the Admiralty to the Committee appointed to inquire into the suitableness and capabilities of the Ports of Galway and of the Shannon for a Transatlantic Packet Station, in connexion with a harbour of refuge … Ordered, by The House of Commons, to be Printed 19 April 1859 257. 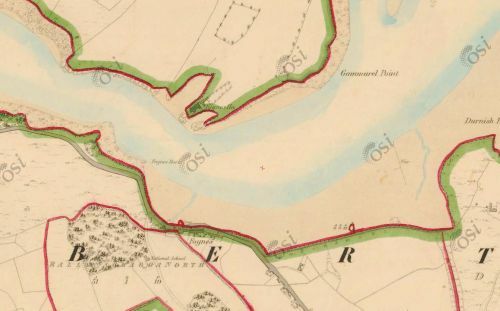 Only the Cork [Cork Examiner 27 September 1852] and Belfast papers [Belfast Mercantile Register and Weekly Advertiser 28 September 1852] were pleased, seeing an opportunity … as did the Earl of Mayo, who wanted the packet station set up in Blacksod Bay. the Post Office to cope with the many links in the chain from the Atlantic through Galway and Dublin to Britain, each link providing an opportunity for things to go wrong — and all of them on the critical path. There do not seem to have been any serious attempts to quantify the likely passenger traffic: at that time, as in the early days of air travel, only small numbers of passengers could be carried and high fares were required. Furthermore, only for small, high-value or perishable freight was the extra cost of steam travel worth paying: for anything else, sail was cheaper. But the enthusiasts do not seem to have been willing or able (at least at that time) to come up with the money required to set up their own steam shipping company: the Dublin committee had decided that it would be too risky an investment given the competition from established operators at British ports. The whole thing sounds like the mad attempt to get a canal to Clones. FOYNES Port is poised to become a major European link with the US in the wake of Brexit, in a new Government proposal that could create hundreds of local jobs. Now, we must immediately eliminate the exaggeration that might be the fault of the minister or the journalist: “in line to be” and “poised to become” might suggest that there is some plan or perhaps even some agreement between the USA and some undefined European body, whereas all we have, it seems, is a bright idea, the first phase of the underpants gnomes’ business plan. Foynes as a transit point for freight to and from North America. This mishmash of unconnected ideas may or may not be the minister’s fault. Let’s see if we can make sense of it. “Our second biggest export destination is the USA. From a Brexit point of view this is an opportunity to attract industries from right across Europe that are exporting into the US,” said Minister Naughten. A ‘hard Brexit’ could result in EU borders, which would increase costs for freight companies shipping out of Britain into Europe. This proposal means that Foynes could become a more attractive destination for these companies to ship from. The first paragraph is nonsense. Existing trade with the US is irrelevant to the proposal. As for the “opportunity to attract industries from right across Europe”, their ability to export to the USA is entirely unaffected by Brexit, unless that nice Mr Trump arranges something really insane with Ambassador at Large Farage. If you’re exporting widgets from Dusseldorf to the USA, why would Brexit cause you to route them through Foynes? The second paragraph is no better. The reality is that post-Brexit exports into the UK are going to be put under pressure, so this is an opportunity to make a new market and make it far more efficient for the export of goods. Whose exports are we talking about? What new market? Far more efficient than what? The third paragraph is confusing. There are, we are told, freight companies shipping out of Britain into Europe. I don’t know why we’re discussing freight companies rather than manufacturers or distributors [the ultimate emptors, who will pay the freight companies for the cost or inconvenience]. But anyway, these companies are shipping “out of Britain into Europe”, so we can assume that the goods start in Britain. If they are to get to Foynes, they still have to be shipped out of Britain into an EU member state, ie Ireland. So instead of going straight to Calais, say, they get shipped to the far side of Ireland and then back to the continent. How does this make the freight companies’ lives easier? Why would the UK/Ireland border be any less hard, or less bureaucratic, than the UK/France? According to the Department, Mr Naughten met with the US Ambassador to Ireland Kevin O’Malley and asked him to support the proposal, which would involve US custom official staff being based in Foynes to give full pre-clearance. I can see that this might create a job or two in Foynes for US customs officials, and perhaps some local admin support. But I see two possible problems. The first is that this might count as an international trade agreement, and Ireland may not be entitled to make its own agreements outside the EU system. I do not, however, know whether that it so. But the second problem seems to me to be more serious: it is that the idea cannot be copyrighted or protected. There would be nothing to stop any other port applying to set up a similar arrangement, getting the benefits of US pre-clearance without the cost and loss of time in sending ships via Foynes. I do not know whether there is congestion at Rotterdam, but if the volume of world trade is falling that problem might solve itself. Nonetheless, it is useful to keep things in proportion. Here is a map showing the whole of the Shannon Estuary. I’ve circled Foynes. And here, on the same scale, is Rotterdam. All those bits that look artificial, too straight to be natural, are docks. You can fly over it yourself here [short URL]. I don’t think much of the overflow from Rotterdam will fit at Foynes. Of course there is lots of space elsewhere in the estuary, but it can’t be used: it’s reserved for the tweetie-birds. That may be a bit of an exaggeration, as you can read here, but the Shannon Estuary isn’t going to get to even 1% of Rotterdam’s capacity. I don’t know what that means. Maybe it’s just attaching another buzzword to the pre-clearance idea. If, though, it involves any sort of transhipment, forget it. Both the Shannon Commissioners’ piers and the packet station campaign sought public money to build facilities in the hope that they would attract private investment. In those cases, and with this present campaign, it might be better to wait for a private-sector investor to put money on the table first. The Waterloo will sail hence for Warren’s Point, This Day (FRIDAY) the 16th instant, at Three o’clock; on TUESDAY the 20th, and SUNDAY the 25th instant. The Mountaineer, C H Townley, will sail hence for Dublin, on SUNDAY next, the 18th instant, at Three o’clock. The Belfast will also shortly resume her station between this Port and Dublin. These being the only Steam-packets which land their Passengers AT THE CITY, by them the Public avoid the dangerous landing at Dunleary in small boats, the hazardous and expensive mode of conveyance thence to Dublin (a distance of several miles), the disagreeable disputes with boatmen, the impositions practised by the lowest order of society, with various other difficulties; against which the complaints are universal. Days of sailing from Liverpool will be, Sunday, Tuesday, Thursday, and Saturday. Apply at the Packet-office, bottom of Redcross-street, or to WILLIAM STEWART. Last Wednesday we were witness to a most melancholy spectacle. We saw three bodies floating on that part of the river Shannon which lies opposite to Castle Lough, in this county. Having rowed in to shore, we gave notice to some persons there, who, without hesitation, prepared themselves, and joined in the sad task of snatching from the watery element the livid bodies of three unfortunate fellow creatures. When we stretched them on the bank they were recognised by one of the Steam Packet Company to be the bodies of Thomas Minshoe, George Halbert, and Robert Williams, three of the unfortunate five that were drowned some few days ago, while on a party of pleasure. The bodies were far advanced in a state of putrefaction and were a revolting spectacle to look on. A messenger being despatched to Nenagh for the coroner, James Carroll, Esq, that officer, with his usual promptness, reached here in a short time; and having empanelled a jury, “Accidentally drowned during a squall” was the verdict. It appeared from evidence that the deceased, with others, left Killaloe on Sunday, the 20th ult, for the purpose of having a day’s amusement on the Upper Shannon. They put in at Castle Lough to take refreshment; during the time they were on shore, the wind freshened and blew a gale, upon which they determined to leave the boat at anchor, and proceed home by land, which they accordingly did. On the following morning they returned and found that the ropes, which were for the purpose of lowering the sails, had been stolen. The day being fine and the weather not likely to change, they made light of the inconvenience, and ventured homeward. After hoisting sails and reaching the centre of the river (which, at this point, is not two miles broad), a squall came on. Having endeavoured in vain to lower sails, which was completely impracticable, on account of the loss of the ropes, the boat suddenly ducked beneath the weight of canvass, and consigned the poor fellows to an early grave. Thomas Minshoe and George Halbert are natives of Liverpool, and Williams from Wales. No coffins being convenient, three fishermen were appointed to watch the bodies on the shore until the next day. When we saw them coffined, we observed that the ear had been eaten off Williams by, we suppose, a dog, and a part of Minshoe’s left leg. They were interred at Killaloe on the afternoon of Thursday.